Hurling through a gorge on a swing, hiking snow-capped mountains, traversing glaciers—the idea of a typical vacation in New Zealand tends to evoke adventure-filled imagery, but you don’t need to be an adrenaline junkie to experience the best of the picturesque South Island. At least that’s the message I, having just returned from a five-day road trip that traced the scenic, lesser-known west coast, keep telling my friends. It’s a landscape made for driving where every bend in the road elicits a reaction. Picture palm-fringed valleys, a piercing azure coastline punctuated by jagged boulders, and mountaintop pit stops that beg you to pause, take a deep breath, and marvel at your surrounds. My journey begins in Nelson, a small coastal city at the top of the South Island that's also the gateway to Abel Tasman National Park, the first stop on our road trip. I'm joined by two friends, and we trace the coastline venturing down to Punakaiki, a town known for its iconic stacked rock formations, and on to Hokitika, famed for its turquoise gorge, before crossing the South Island through Arthur's Pass, bound for Christchurch. The trip breaks every preconceived idea I have of a vacation in New Zealand, often touted as a romantic honeymoon destination or adventure capital. Far from the headline tourist attractions, we enjoy a quieter path, meandering through small towns, buying our coffee from roadside carts, and ending each day with a glass of wine in a local lodge. Grab your friends. Here's why a road trip across New Zealand will be your best getaway yet. Shallow sandbars create turquoise and white swirls below as our plane circles the top of the South Island before descending to Nelson Airport. It's a mesmerizing glimpse of what's to come. While Queenstown, Wanaka, and other destinations to the far south often steal the limelight, this region is a water and nature lover's paradise, best explored by car, foot, and kayak. Nelson, a relatively small coastal city facing Tasman Bay, is the perfect starting point to explore the region. After touching down at the newly designed airport (a stunning blonde wood structure that's a testament to cool New Zealand design), we pick up a car, toss our bags in the trunk, and hit the road. The drive from Nelson to Abel Tasman National Park takes just over an hour and has some of the best scenery of the five-day road trip, including vineyards bathed in the golden late afternoon light and vistas overlooking Tasman Bay. Be sure to stop off at Mapua Wharf at the mouth of Waimea Estuary for lunch and a drink at the local brewery. Though it might be New Zealand's smallest national park, there's no shortage of things to do at Abel Tasman National Park. Dedicate at least two days to explore the area, which is known for its long winding coastal trails and diverse wildlife. Abel Tasman Kayaks offers three guided kayak and walking tours that allow you to experience the best of the park if you have limited time. Each variation includes hiking a section of the coastal track, lunch on a secluded beach, and kayaking through the protected reserve. Paddle past untouched islands that sing with the song of native birds and catch a glimpse of the resident sea lions—or even an orca, if you're lucky. Make Abel Tasman Lodge your home base during the trip and be sure to reserve an hour in the outdoor hot tub. The secluded tub is surrounded by locally cut logs (many of which are sprouting new ferns) and has spectacular views of the surrounding mountains and paddocks. The lodge itself is a standout in the area—it was awarded the number two best hotel in New Zealand for its modern, well-designed chalets and excellent service. It takes four hours to drive from Abel Tasman National Park to Punakaiki without any stops, so brace yourself for a day on the road. Grab breakfast at The Fat Tui, a gourmet burger truck stationed minutes from Abel Tasman Lodge, and take a coffee to go. 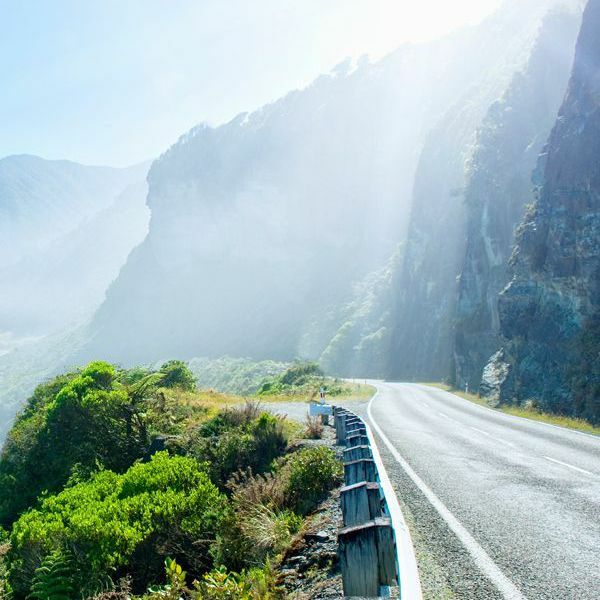 The road to Punakaiki is typical for New Zealand: mountainous, winding, and incredibly scenic. As you near Punakaiki, the scenery transforms as palm tree–fringed mountains give way to rugged surf and pebble beaches. Trust us, you'll want to pull over and take a picture at every bend in the road. Punakaiki is best known for the Pancake Rocks, naturally-occurring stacked boulders that were formed over 30 million years ago. Though quite touristy, it's well worth wandering the boardwalk to see the blowhole, rocks, and stunning coastline. The area has a ton of easy hikes that show Punakaiki's incredible natural diversity, including the Truman Track. The accessible 30-minute walk takes you through lush forest, thick with tall flax bushes, and to a lookout point with views of the Tasman Sea and Truman Beach. Locals recommend going further—clamber over the boulders at the other side of the beach to find a hidden path. There are two options to make your way across to Christchurch: Continue the road trip as we did, driving down to Hokitika then across through Arthur's Pass, or catch the TransAlpine, often considered one of the world's greatest train journeys. If you opt to drive, you'll be able to visit Hokitika Gorge, which has intense turquoise water and plenty of walking trails through lush native bush. Rest up at Beachfront Hotel Hokitika, a recently renovated waterfront hotel in the heart of town. It's well-worth splashing out on the penthouse suite, which has floor-to-ceiling views of the ocean, a spacious living area, and a comfortable king bed. If you'd rather finish your journey by train, drop the car in Greymouth and jump aboard the TranzAlpine. The inland route cuts across the South Island along the edge of the ice-fed Waimakariri River and through the famous Southern Alps. The train stops at Arthur's Pass, a popular base to hike the surround national park. If time permits, jump off and spend the night here, before continuing the next day to Christchurch. The oldest city in New Zealand, Christchurch, is entering an exciting new phase. Shattered by the earthquakes that destroyed many heritage buildings in 2010 and 2011, the city is making the most of the chance to rebuild and redesign. It's clear that smart design and innovation is at the core of Christchurch's modern DNA—cool cafes and hipster hangouts continue to sprout as the city crafts a new identity. There are endless ways to end your trip in Christchurch. Stop by C1 Espresso, a retro cafe that delivers sliders by pneumatic tubes, sample modern Maori cuisine at Kakano Cafe, cycle through the beautiful Botanic Gardens, and wander down colorful New Regent Street. By trips end, you'll want to hop in the car, hit the road, and do it all again—we certainly did. This trip was hosted by Tourism New Zealand. Writers' opinions are her own.